The much-derided venture capitalist can be a useful accelerant for the startup that uses the cash wisely. No matter how good your product, without the right amount of investment you won't be able to scale up product design, research and marketing to the point where you can attract the really big customers, hire the best engineers and source the best components. The A-round gets you serious product development money so you can rent offices and hire engineers. The B-round gets you basic sales and marketing infrastructure, basic business operations and product development up to and past beta test. If you prove that the product works and that customers will pay money for it and like it, then you get the take-off money, the launch pad lift-off C-round. That C-round will generally dwarf the others because you're doing serious build-out of sales and marketing and business operations infrastructure while continuing product development. The VCs have been encouraged by your results from the A- and B-rounds and are ready to punt in serious amounts of dollars from which they hope to receive a 5X payout when your business is acquired or goes through an IPO in a couple of years time. 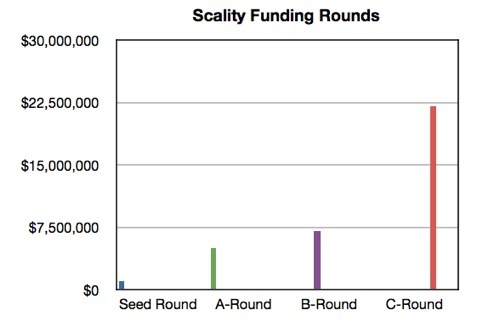 Scality said the C-round "was led by Menlo Ventures and Iris Capital with participation from FSN PME and all existing investors, including Idinvest Partners, OMNES Capital and Galileo Partners. Scality will use the funding to strengthen its worldwide sales & marketing initiatives targeting enterprise and service provider markets, and to increase investment in its … R&D team." It said that it had increased sales 400 per cent year on year and customers included "four of the top 10 cable operators in the US, the second largest telco in France, leading portals in Italy, Germany, and UK, and several mobile operators in Japan. "More recently, Scality announced its entry in the Media and Entertainment market, and just signed RTL, the second largest media group in Europe for its Video-on-Demand offering." Again, classic B-round funding success showing good potential for future sales to the VCs which happily dipped into their bank accounts and put $22m on the table. Jerome Lecat: We are actually not avoiding the OEM route, it is just that for an OEM to work you need to really help your OEM position appropriately the product and brief their sales force. I believe that this is what Caringo failed to do with Dell. The reality is that our product is not needed by the mainstream yet, same for our competitors. It is for the service providers, enterprise and government that need to set up a lot of storage, more than 1PB, and who need to manage growth of such storage. Signing a mainstream OEM leads to a lot of wasted energy as they don’t know how to position the combined product. We started with SGI on purpose. SGI’s core strength is cloud, HPC, media and government (see their annual report). These industries need large amount of storage and they are interested in our “kind of beauty”. Furthermore, SGI is experienced at positioning and selling technical products. Finally, SGI, like Quantum and IBM have their own HSM software (called DMF), and it is very easy for SGI to position Scality based storage as an alternative to tape, nearly as cheap, and allowing archive to be accessed by multiple users real time. I actually believe that today, the market want to buy storage in the form of appliance rather than software. This will change over time but this is the reality of today. Yet, Scality will stay a software company, we count on our OEMs, like SGI, to package it as an appliance. Today’s reality will evolve as the mainstream starts understanding the benefits of “Software Defined Datacenter”; we are ready for that era. El Reg: Can you say how you avoided the multiple small files trap that tripped up Amplidata? Jerome Lecat: We actually use different technology to deal with small files (10 KB), large files (100 MB) and very big files (1 GB+). This is built in our software, and it is only exposed as a policy to our customers so it is simple to use. As an example, for small files we use replication as a data protection mechanism, while we use erasure code for large files and very big files. Another “trick” is that we pack small files in “containers” to avoid using an inode per file, while on the contrary we split very big files in many large files. This allows us to deliver very high IOPS and low latency, which is what matters for small files, while we can also deliver high throughput and cost effective data protection which is what matters for big files. Our purpose is really an all-in-one platform for unstructured and semi-structured data. Amplidata and Cleversafe focus on the archival market, where it is not necessary to handle small files with low latency. We have customers with average file size as low as 10 KB, and we are currently doing a proof of concept with a lab which manipulates 1 PB large files! El Reg: How does Scality differentiate itself from CleverSafe? Jerome Lecat: Scality’s vision is to deliver a unified storage platform for files and semi structured data based on 100 per cent software technology. By definition of this vision, we want to handle both small and large files, both high performance and cost effectiveness, and support all standard interfaces. There a huge management benefit in an all-in-one platform. It is an ambitious goal, but looking at our technology introductions in the past three years we are confident we will get there. Cleversafe is more specialised on the archival market... There are projects where Scality and Cleversafe compete head to head, but it is less than half of our projects, and Cleversafe would probably say the same. Jerome Lecat: Exablox is very different. Their focus is on the mid-size market. They completely hide the object back-end to offer a simple scale-out NAS based on object storage. Their focus is on making it so simple that any company can deploy it. The appliance form factor is a must for their target market. Our focus is on the peta-scale. Our customers are sophisticated. They don’t want the simplest system, they want a system extremely versatile to meet their specific need while being easy to manage and grow. Jerome Lecat: I would rather not comment on Atmos. El Reg: Do you run into HDS's object offering at all? El Reg: Ditto HP's object offering? Jerome Lecat: HP is a longer story. We do see Ibrix from time to time, but it does not seem to be very successful. We actually work a lot, and successfully with HP server division, especially since they introduced the SL45xx series. El Reg: In general will the mainstream vendors (Dell, HDS, HP, EMC and NetApp, whose object storage is tied to their hardware, be less successful in the market (and tend to lose vs Scality) because their object storage software is less well-integrated with the applications in the vertical markets? Jerome Lecat: As I mentioned earlier, I actually think that most customers TODAY would rather buy an appliance than a software. So the fact that the object storage offering of major vendors is integrated in their hardware offering should not limit them today. What customers demand is the ability to separate the software from the hardware in the future. For most of these players, it is a corporate decision, they could do it if they decided to offer it. As an example, Jean-Luc Chatelain from DDN stated at the object summit that they can sell [their] Web Object Scaler as software for deals that are over 80 PB. I think that the problem with many of the companies you mentioned is that their object storage offer is sub-par to what start-ups like Scality and Cleversafe have built. I also agree with you that integration with applications is key for success, and we invest a lot in specific integration and in developing scale-out standard interfaces like our scale-out file system, which makes such integration seamless. El Reg: If not this, then why do you tend to win against them - if you bid against them in customer engagements? Jerome Lecat: We focus on large-scale deals. Our average deal size is about $500K, and most of them have a bake-off or proof-of-concept of some kind. We are not always the lowest bidder, but we are always the best technology to handle the task at hand. As one of our customers stated to Menlo Ventures during the due diligence: “We bought Scality software because it works”. Pretty simple! Watching successful startups is like looking at water skiers. They are tugged along by their motor-boat, rise up out of the water on their water skis and then execute the turns and flips they delight in. As long as everything works it's fine and it doesn't look like knife-edge stuff. But it is and the line between success and failure is thin and ever-moving.